Let The Children’s Museum of Green Bay come to you! 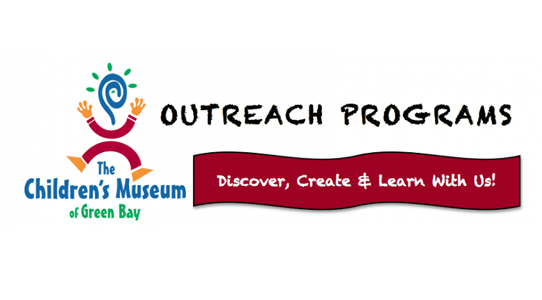 Our outreach programs bring the museum’s resources and expertise directly to the comfort of your organization. Experience an interactive program designed for grades K-4. You are sure to love it! Outreach programs include hands-on activities facilitated by a member of our education team, and all programs align with Common Core and Wisconsin Model Academic Standards. All programs are 60 minutes in length and are suited for grades K-4th. Max class size is 25 children (adult participation is required). Cost of program is $75 per class. Explore the force of gravity and the properties of air! You will experiment with parachutes and create your own flying apparatus. Your mind will soar to great heights with these new concepts. Did you know that objects are still magnetic underwater? Find out how that is possible along with other truly magnetic activities. Discover what makes an object magnetic, experiment with magnetic poles, and even create a work of art by using magnets! You’re bound to be “attracted” to this program. What is nano science? This science is on the scale of a nanometer, just one billionth of a meter! Even though you cannot see these super small structures, you will perform measurements and activities that bring the world of nano science to life before your eyes! Beaks come in all shapes and sizes, but did you know that beaks have different jobs too? You will yearn to learn about birds with hands-on activities and an art project. Pop! Explore how bubbles behave and investigate the properties of different materials as you complete our challenges to engineer your own bubble wand. Bend, twist, and fold! Create unique, 3-D art projects without using tape or scissors. You will learn about ancient Japanese origami and discover the steps to paper quilling. You’ll have colorful projects and lots of ideas to take home with you. Try your hand at catching rainbows with these de-“light”-ful activities. Learn about the properties of light and create your very own kaleidoscope. CONTACT WHITNEY TO BOOK YOUR OUTREACH PROGRAM! Programs are subject to availability and group size. Additional travel fees apply to sites outside of greater Green Bay.